Publisher: Warner Bros. Developer: TT Games. Other versions: XONE; PS4; PS3; WIIU; PC; VITA; 3DS; DS. What started as a left-field adaptation of George Lucas’s sci-fi prequels has turned into a gaming phenomenon. Traveller’s Tales, whose inception in 1990 was followed by a period of modest output, finally struck gold in 2005 with LEGO Star Wars, which was a smashing success and charmed many a gamer. Now, we’ve seen adaptations for Indiana Jones, Lord of the Rings and Pirates of the Caribbean. While DC comics have seen two LEGO adaptations, Marvel has been untouched by the series until now. With stacks of iconic characters and plenty of humour to go around, LEGO Marvel Super Heroes finds success despite some minor issues. Much like the LEGO Batman games, Super Heroes crafts its own story, though it’s clear that much of its influence comes from Avengers Assembled. The general thread is that a convoy of super villains – from Doctor Doom and Loki to Abomination and Magneto – are planning to utilise special cosmic bricks to do evil-bidding, and naturally an equally large group of heroes are trying to prevent that. Its basic stuff, but the humorous cut-scenes keep the pace up. Plenty of references to the Marvel Cinematic Universe come into play, but other jokes also please non-fans at the same time. The tongue is firmly placed in the cheek here, much like any other LEGO game. "No Stan, it's actually not that bad... He jumped. He actually jumped"
What three Shredded Wheat does for ya. For those who haven’t kept up with the myriad of Lego games lately, Super Heroes firmly grasps the template established in the last game, LEGO Batman 2. Rather than using hubs like the previous games, Super Heroes uses an open-world format, as story missions, collectibles and side missions are all available in a moderately sized New York, tailored to fit all the landmarks of Marvel Comics. This includes Baxter Building, the Daily Bugle and Stark Tower. It’s definitely a broader format, though close inspection can cause scrutiny. Glitches often make it impossible to complete side missions, forcing a reload, and the frame rate can tank during explosive free-roam moments. That being said, it’s definitely fun to explore and search for all the collectibles. Outside of the free-roaming, main story missions remain similar to previous instalments. Levels combine platforming, puzzling and punching to good effect, presenting an experience kids can easily get into while also incorporating some challenging puzzles to keep older players on their toes. Puzzles usually boil down to figuring out what super-power is needed to open the path up. There are more than 150 characters to unlock, though you’re limited to specific heroes on your first playthrough. Each comes with different powers: Hulk can lift large objects, Thor can trigger electronic switches and Black Widow can turn invisible to avoid detection. Super Heroes thrives off its roster of characters, as the sheer breadth of characters – and powers, as a result – keep missions fresh, while the injection of dozens of minor villains as bosses tickles the fanboy bone. Super Heroes will take about 12 or so hours to finish. Like before though, many of the hidden collectibles in each level will be impossible to collect until you return with unlocked characters, meaning a good two playthroughs will be required to earn that coveted 100%. That doesn’t include the hundreds of collectibles hidden around Manhattan, which similarly require unlocked characters to complete. Outside of that, many collectibles require you to complete special side missions to unlock, such as destroying a certain object or, in one weird case, steering a lion up to the top of a skyscraper. When you tally together all these extra elements, you could easily be looking at 30 or more hours of gameplay, which is plentiful to keep you busy. Someone's going to have to clear up after this is all done. One of Super Heroes’ biggest strengths is its playful presentation. Certainly, the engine is probably the prettiest it will be on this generation of consoles, with a soft blur on cut-scenes, detailed environments and charming animation all making the game look good, even if frame rate issues can crop up. But it’s truly the audio which shines. The soundtrack borrows cues from Avengers Assemble, but perfectly fits the action. But what makes the game is the dialogue. Slick heroes bounce jokes off of each other at a fast pace, making it a laugh-a-minute, while villains appropriately chew any scenery in front of them. And naturally, it’s brimming with jokes and Easter Eggs, referencing the comics, movies and even more obscure properties, and they mostly succeed in putting a smile on your face. 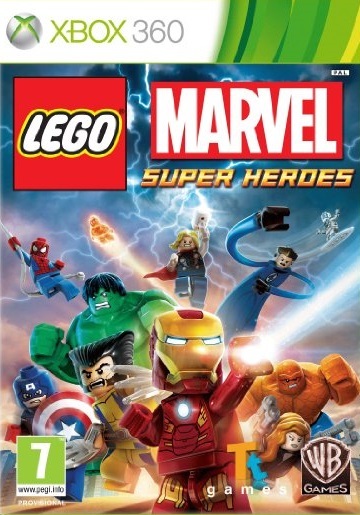 Though some may claim the LEGO formula is stagnant already, LEGO Marvel Super Heroes proves that the series can continue to thrive so long as the source material is strong enough. Marvel proves to be a huge component in the success of Super Heroes, as the A-Z of characters with differing powers keeps puzzles fresh. The reams of collectibles and unlockables certainly will keep you hooked to the game, and the presentation keeps you laughing for the most part, even if you’re only a mild fan of the source. Though the gameplay perhaps needs to evolve with the next instalment, and bugs threaten to spoil the fun, anyone with a remote interest in Marvel – be it through comics or the movies – will get hours of fun out of Super Heroes.